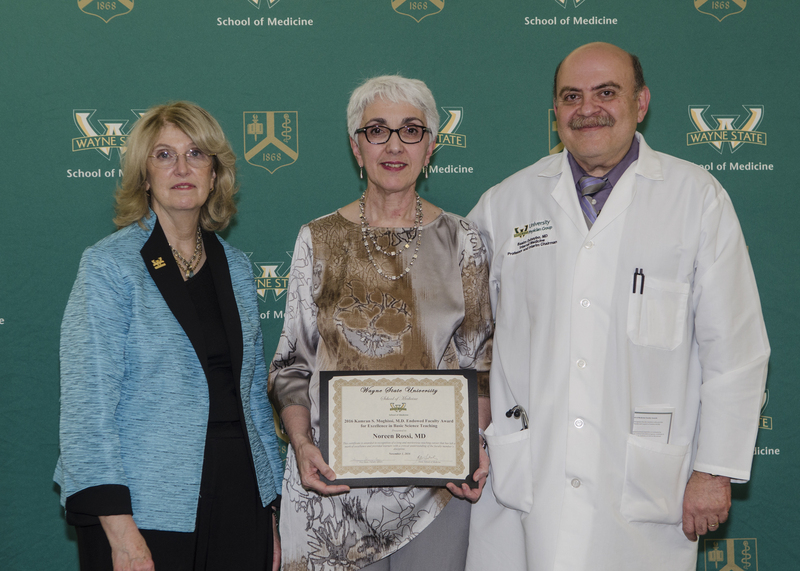 The Wayne State University School of Medicine recognized outstanding members of its faculty during the annual Faculty Recognition and Awards Ceremony. Celebrated Nov. 1 in the schoolâs Margherio Family Conference Center, the ceremony included the presentation of College Teaching Awards and Research Excellence Awards. Vice Dean of Faculty Affairs and Professional Development Virginia Delaney-Black, M.D., M.P.H., welcomed the award winners and their guests before distributing the awards. Research Excellence Awards are presented annually and evenly distributed among assistant professors, associate professors and professors from the Basic Science and Clinical Science departments based on criteria defined for each academic rank. In addition, five faculty members were singled out to receive Deanâs Office Awards. Established in 2012, these awards come with a $500 award in addition to a certificate. The Kamran S. Moghissi, M.D. Endowed Faculty Award for Excellence in Basic Science Teaching is given to a faculty member who, through long and meritorious teaching of basic sciences, has left a mark of excellence and provided students with a critical understanding of the faculty memberâs discipline. The purpose of this award is to recognize faculty achievement, to encourage continued progress, and to provide assistance to faculty who demonstrate significant contributions to the teaching of basic science courses during the first two years in the School of Medicine. This yearâs award was given to Noreen Rossi, M.D., professor of Internal Medicine and program director of the Nephrology Fellowship. Basim Dubaybo, M.D., interim chair of the Department of Internal Medicine, wrote that Dr. Rossi, âthrough long and meritorious teaching of basic sciences, has left a mark of teaching excellence â¦ while providing students with a critical understanding of her field,â in his nomination of her. The Excellence in Clinical Teaching Award was presented to Karoline Puder, M.D., associate professor of Obstetrics and Gynecology. The award goes to a faculty member who, through long and meritorious teaching of clinical or behavioral sciences, has left a mark of excellence and provided students with a critical understanding of the faculty memberâs discipline. Michael Bannon, Ph.D., professor of Pharmacology, received the Outstanding Faculty Mentor Award. The award is presented to a faculty member who has served as an outstanding mentor to other faculty at Wayne State University School of Medicine and demonstrates a gift and passion for mentoring other faculty. He was nominated for the award by Sokol Todi, Ph.D., associate professor of Pharmacology and of Neurology. The Outstanding Research Achievement Award was presented to Donal OâLeary, Ph.D., professor of Physiology and director of Cardiovascular Research for the School of Medicine. Dr. OâLeary was nominated by J.P. Jin, M.D., Ph.D., professor and chair of Physiology, as well as a number of medical researchers at other universities. Patricia Brown, M.D., professor of Infectious Diseases, received the Women in Medicine and Science Leadership Award, given to an individual who has supported and/or brought recognition to women faculty members or activities for women faculty. Dr. Dubaybo was one of three who nominated Dr. Brown for the recognition. Kamran S. Moghissi, M.D., Endowed Faculty Award for Excellence in Basic Science Teaching: Noreen Rossi, M.D. Excellence in Clinical Teaching Award: Karoline Puder, M.D. Outstanding Faculty Mentor: Michael Bannon, Ph.D. Outstanding Research Achievement Award: Donal OâLeary, Ph.D.
Women in Medicine and Science Leadership Award: Patricia Brown, M.D.